Rory McIlroy has urged the PGA Tour to accept golf's governing bodies' decision on using long-handled putters. Ruling bodies the R&A and US Golf Association want to ban belly and broom-handle putters from 2016. But PGA Tour commissioner Tim Finchem appears to be against such a proposal. "We've trusted this game of golf; we've put it in the hands of the R&A and the USGA for I don't know how many years, and we've always abided by the rules that they have set," said McIlroy. "I don't think this should be any different. I think golf is pretty good at the minute and it's in good hands." Last November, the R&A, which was set up as a distinct entity separate from the Royal and Ancient Golf Club in 2004, and the USGA proposed a ban on players anchoring putters to their body to help preserve the "skill and challenge" of putting. Players and the golfing community were then given 90 days, until 28 February, to discuss the plan. But Finchem's comments, that there is "no overriding reason" to ban the putters, raise concerns about different rules emerging in different competitions. "I saw what Tim Finchem had to say and it seems like the European Tour is going to go a different way," said world number one McIlroy, 23. "I read a thing Monty [Colin Montgomerie] said that this divide isn't good for golf and I don't think it is. We either need to all be on one side or the other." 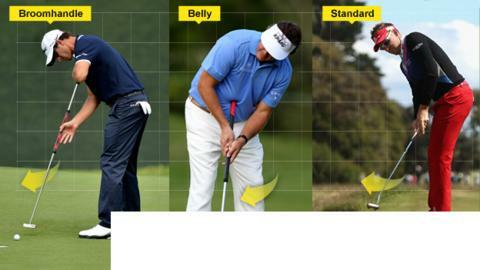 Players using long-handled putters anchor strokes to a pivot point, such as their chest or midriff, and three of the past five majors have been won by those using that method. But McIlroy, who uses a conventional putter, says he would not have an issue if long-handled putters remained being used in the sport. "It's up to the governing bodies at the end of the day to decide," added McIlroy, ahead of his defence of the Honda Classic in Florida starting in Thursday. "I sort of think it was a bit of a knee-jerk reaction to how much success people were having with it. "I'm all for people enjoying the game and trying to make the game as easy as possible and bringing people to the game, and if that means they should allow anchored putters to make it easier for the general public then that's a good thing. "But then they talk about bifurcation, whether you should have one set of rules for us and one set for the amateurs and it's just a bit of a mess and opened a can of worms. "If it were up to me I would just (follow) whatever decision the USGA comes to ... maybe the pressure that the PGA Tour has put on them might change their minds and (make them) rethink. "And if they do that, then that's totally fine with me." American Keegan Bradley, the first player to win a major using a belly putter, at the 2011 US PGA Championship, says he is sick of being called a "cheat" by fans. "I take great offence to people calling me a cheater. I think that's unbelievable," he told reporters ahead of the Honda Classic. "I can't imagine how people can say that to me or to anybody out here. I'm sick of it to be honest." Bradley said of Finchem's comments: "I'm very proud and it makes me feel good that my tour, the tour I play on, has my back." The R&A has said it will be making no comment until the consultation period concludes, when the European Tour is also likely to reveal its stance.